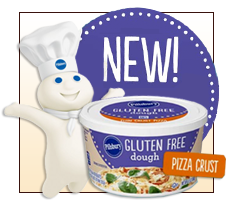 Pillsbury Gluten Free Thin Crust Pizza Dough - Going gluten-free isn't the easiest, especially when it comes to PIZZA. This premade sans-gluten dough might be just what you're looking for. A serving (1/6th of the container) has 170 calories, 4g fat, 600mg sodium, 30g carbs, 2g fiber, 4g sugars, and 4g protein (PointsPlus® value 4*). Roll out the dough extra thin, and you'll likely be able to get eight servings out of that container. Or just try it in these HG recipes! Oscar Mayer Selects Chicken Breast Franks - Memorial Day is next Monday, which means the unofficial start to summer is almost here. Be prepared with these lean chicken hot dogs! With no artificial preservatives and 65 percent less fat than most standard beef franks, each one has 80 calories, 5g fat, 400mg sodium, 2g carbs, 0g fiber, 1g sugars, and 7g protein (PointsPlus® value 2*). Fire up the grill! New Flavors! KIND Nuts & Spices Bars - Our pals over at KIND are getting creative with some brand-new flavors. We're totally excited about the Maple Glazed Pecan & Sea Salt and the Dark Chocolate Chili Almond bars! (The chili is pretty mild -- don't be scared.) Each bar has 200 - 210 calories, 15 - 16g fat, 115 - 140mg sodium, 13 - 16g carbs, 5 - 7g fiber, 5g sugars, and 6g protein (PointsPlus® value 6*). They're just rolling out now... Look for 'em nationwide! POLL ALERT!!! Do You Want a HUNGRY GIRL DIET PLAN? Weigh In NOW! CALLING ALL HG READERS: We NEED your input!!! Over the years, we've had THOUSANDS of requests for a structured way to implement the HG philosophy and recipes into a weight-loss plan. So we're putting feelers out right now to find out what YOU think of an HG diet plan, and what factors would be most important to you in such a plan. Even if you're just plain not interested... We want to know that too. Please, please, please take our very short poll RIGHT NOW! Your feedback matters!!! We cannot thank you enough for taking a minute to help us out... Just CLICK HERE to answer a few quick questions. Thanks again! Take Our Quick & Easy Poll Now! Saucy Mama Mustard in Dill, Hatch Chili, and Creamy Garlic - Our love for Saucy Mama has been going on for a while now, and these three newest offerings are extra special. The Hatch Chili mustard is an explosion of flavor -- sweet, tangy, and spicy. The pickle-icious Dill and the Creamy Garlic have stolen our hearts (and mouths) too! A teaspoon of each has 10 calories and 0 - 1g fat (PointsPlus® value 0*). Look for these at specialty retailers, or just order online! Traina California Sun Dried Tomato Ketchup - You read that right. Ketchup made from flavorful sun-dried tomatoes! There are even little bits of those tasty tomatoes in the mix. Each tablespoon has 20 calories and no fat (PointsPlus® value 0*). Our California pride swells with each bite! At select retailers and online... You might want to gather some friends and order a case! Supermarket Standouts! Looking for special cookout condiments that are easier to find? We LOVE Limited Edition Heinz Tomato Ketchup Blended with Real Jalapeño and Hellmann's/Best Foods Dijonnaise! Here's a tasty way to beat the heat: From May 24th through May 27th, stop by participating 7-Eleven locations for a 49-cent medium Slurpee... and make it a Lite one! In addition to this weekend's discount, Sugar-Free Sprite is joining the impressive Lite lineup of Fanta flavors: Sugar-Free Cherry Limeade, Sugar-Free Strawberry Banana, and Sugar-Free Mango. Each of these has around 20 calories per 8-oz. serving. COOL! ***Sweet news! Hungry Girl 200 Under 200 Just Desserts is debuting on the New York Times Best Sellers list! Thank you to everyone who bought the book and helped make this possible! If you haven't gotten your copy, click here for super online savings or find it wherever books are sold. ***Speaking of HG, wanna chat LIVE with Lisa Lillien, a.k.a. Hungry Girl herself? Hop on over to the Fiber One Facebook page this Wednesday at 2 p.m. ET/11 a.m. PT! LL will be gabbing about fiber and answering any Qs you might have. Pencil it in! ***If you're already thinking about lunch, we've got good news. The Strawberry Poppyseed & Chicken Salad has returned to Panera Bread! Dressing and all, the limited-time-only salad has 350 calories and 13g fat (PointsPlus® value 9*). Strawberries, blueberries, pineapple, pecans, and chicken on your salad mean a fruit 'n protein par-tay for you! And that's all we've got. HG out! 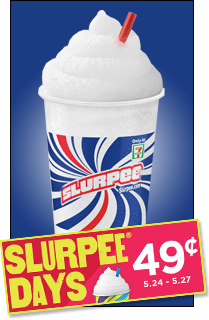 Cool Off with a 49-Cent Slurpee Lite! Click "Send to a Friend" to pass around this email. 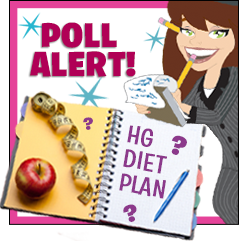 We want as much input as possible on the HG diet plan! Ooh, it's National Pick Strawberries Day! We pick (as in choose) strawberries on the regular. Check out last Friday's HG Salutes email for a bevy of berry-good info!